What started out as simply Sweat Therapy has turned into so much more for Taylor, a Fort Worth rider who found her ride-or-die TRYBE in the Dome. Read how the ZYN22 community has shaped her experience – both in and out of the studio – since she moved back to Texas and saddled up for the first time last year! Picture this: Oklahoma 2015 a twenty something second grade teacher decides to move back to Texas to be closer to family. It was me. Over the next year I started taking care of myself for the first time since I graduated college. I started with barre, then in June of 2016 I decided to try something new to add to my workout routine. Both my sister and my childhood neighbor loved ZYN22, so I decided to give it a try. 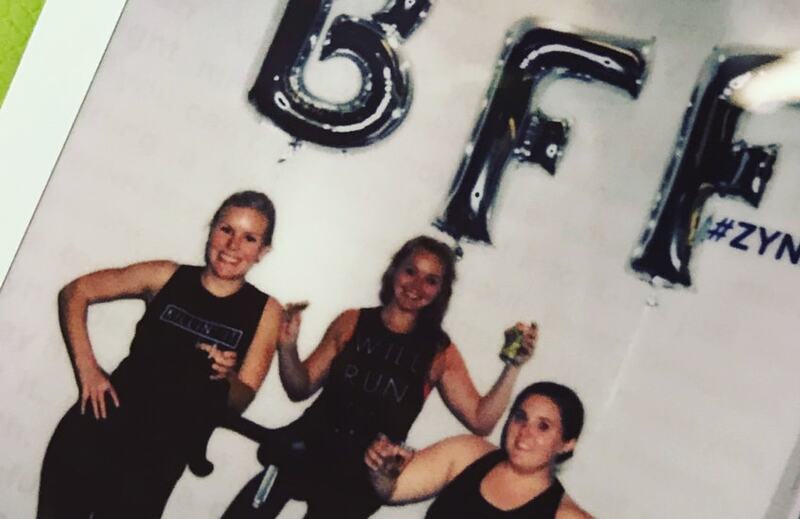 My first class was Kathryn’s Monday lunch bunch and during the first song I realized that this wasn’t like the one and only other spin class I took back in college… At that point I wasn’t entirely sure I would make it through the whole class, but I did! (If you count sitting for most of the class while being off the beat- which, I do.) There was something so wonderful about it and before I knew it I was hooked. After that first ride I was doing things I never thought I’d do; things like waking up for a 6:30 AM spin class during the summer, which was unheard of for this teacher. Then slowly I was able to stay up out of the saddle longer in class until one day I stayed up the whole class. I remember being so proud of myself that day. The best part is that now, over 300 classes later, I’m still having moments like that where I am so proud of myself for the things I am able to do in the Dome. Something that started off as a way to lose more weight became a great source of stress relief from a high stress job. Eventually I moved up from the third row to the second row, and now you can find me front-and-center on Bike 6. During this time I stopped caring about being a certain weight. I came to ZYN because it made me happy and THAT’S when the weight started falling off. The less I cared about the number on the scale, the happier I was and the quicker the weight came off. I’ve lost about 30 pounds since I started ZYN, but honestly, that is such a small part of what ZYN has done for me. Community is such a big part of my life. Community is made up of the people you surround yourself with wherever you go. My work life is all about cultivating a great community inside the school. I spend my day making sure that inside the walls of my classroom, my students feel like a valued part of our class so that when they leave the class they know that they matter. Your community gives you a sense of purpose, a sense of belonging, and a sense of who you are. Without your community you are not whole. I used to be the person who loved it when my plans were cancelled because I loved my alone time… I needed my alone time. These days, however, I am constantly surrounded by my ZYN community (in the best way). My TRYBE is no longer just inside the Dome. The people I’ve met at ZYN have become some of my favorite and closest friends. My goal every time I walk into ZYN is to make sure that I give back what I have gotten from ZYN. I want to be the person that someone can talk to if they are nervous about riding for the first time, or the person they can laugh it off with if they just could not get their body to move the way they wanted it to that day. That is what makes ZYN so special- because even if you don’t know each other, you still have this one awesome thing in common that can help form the most wonderful of friendships. I’ll never forget sitting at home one night when I got a Facebook invite from a fellow rider, Whitney, to Erin’s birthday celebration. I was convinced they had confused me with someone else and that I wasn’t who they meant to invite. I will forever be grateful for that invite because that was the night my ZYN community moved from people I saw in the Dome to people I hang with in the real world. Most recently though my Zyn community was there for me when a pipe burst in the apartment upstairs causing a downpour in my apartment. I was at home waiting for Erin’s Sunday afternoon class when all of a sudden I heard a noise that sounded like water coming from my upstairs neighbor, then before I knew it there was water coming in from the ceiling. As you can imagine it was not a welcome sight. Later that day I told Erin that I needed a drink and she immediately said that we could hang out at her house. That night as I sat in her living room in my sweats, physically and emotionally exhausted with Erin, Kathryn, and Seth, I was so thankful to have people that I could call on like that. I didn’t need them to do anything for me, I just needed someone to vent to and laugh with about the whole ordeal. It’s little moments like that that make this place so special. It’s what separates ZYN from the others. We have such a strong community backing us up no matter where we are at or what we need. My biggest piece of advice, that you didn’t actually ask for is this: put yourself out there. Talk to all the people. In the last year I have gained some of my best friends all because I started talking to people. If you saw us out you wouldn’t know that we haven’t known each other our whole lives. So put yourself out there kids and find your TRYBE! Who’s your ride-or-die TRYBE? Saddle up this week, becuase Sweat Therapy is better with your besties by your side!